The P5 are the biggest arms dealers on the planet and pose an incredible risk to all human beings thanks to their massive stockpiles of nuclear weapons. They’ve had over 70 years at the wheel. Maybe it’s time for them to step aside, so the rest of us can solve the world’s problems. Like many others, I think the Security Council’s record shows that “security” is only for a select few. Together, these five representatives have undeniable power to shape global affairs. Power to unleash global calamity on a Biblical scale: “And power was given unto them over the fourth part of the earth, to kill with sword, and with hunger, and with death, and with the beasts of the earth.” (John 6:8). Nuclear war and environmental catastrophe are two realities of today–realities created and owned by the P5. 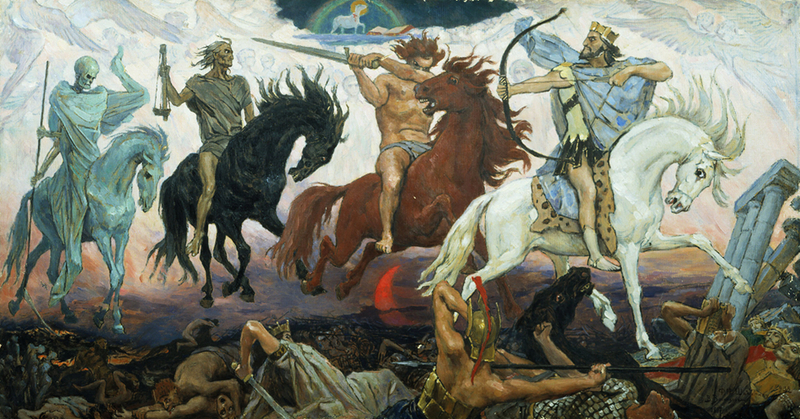 Two millennia after that Biblical prophecy, the UN Security Council has unleashed its own Four Horsemen–War, Death, Famine and Conquest–and must take responsibility for their costs. Globally, the P5 are the five biggest arms dealers. Together, they sell a total of 20.45 billion U.S. dollars worth of weapons per year. 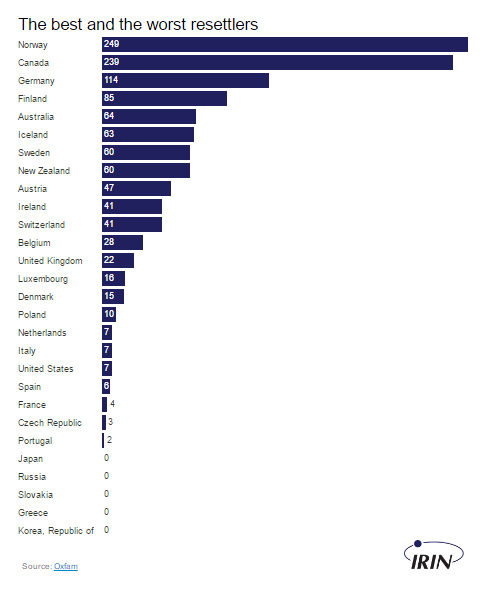 This is more than triple the next 10 biggest arms dealers, who happen to be P5 allies within NATO. The United States is overwhelmingly the biggest weapons exported, with nearly double the sales of its former Cold War adversary, Russia. Guns, ammunition, tanks, bombs, missiles, battleships, warplanes: these are some of the products the P5 nations are selling all over the world. The P5 aren’t fighting on their own soil. Instead they help protracted conflicts go on far longer than they should. Two-thirds of UK weapons have been sold to Middle Eastern countries, since 2010, where instability has fed into increased risk of terror threats to Britain and across the West. Since 2010 Britain has sold arms to 39 of the 51 countries ranked “not free” on the Freedom House “Freedom in the world” report, and 22 of the 30 countries on the UK Government’s own human rights watch list. Russia has supplied arms to several countries where they risk being used to commit serious human rights violations. It does not publish arms export details, but 10 per cent of all Russian arms exports are believed to go to Syria, making it the country’s largest arms supplier. Transfers include missiles and missile launchers, anti-tank missiles for the Russian-made T72 tank, and MIG jet fighters jet aircraft. Russia also supplied AK-style assault rifles to Libya under al-Gaddafi. As of 2004, “Of the estimated 500 million firearms worldwide, approximately 100 million belong to the Kalashnikov family, three-quarters of which are AK-47s”. Russia continues to supply helicopter gunships to Sudan, where they have been used to attack civilians in Darfur and Southern Kordofan. As the main arms supplier to Egypt, the US authorized the sale of small arms, millions of rounds of ammunition and chemical agents for riot control, despite the security forces’ violent crackdown on protesters. Yemen was also supplied with small arms, chemical agents and armoured vehicles, and Bahrain with small arms. It provides Colombia’s security forces with arms, military aid and training, despite their persistent violations of human rights. 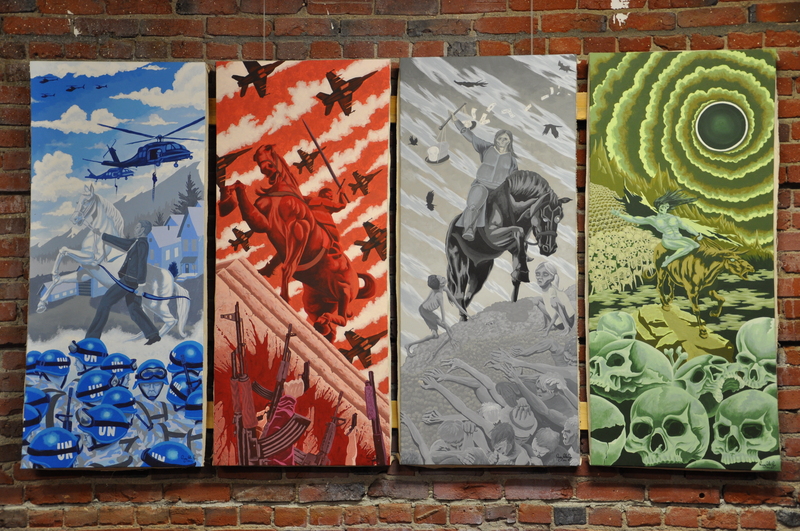 For decades, the United States and Russia fought their Civil War through proxy wars of already struggling nations. Latin America, Africa, the Middle East and Asia have all been victims of these powerful countries warmongering and arm dealings. These two nations, like the rest of the P5, continue to wield power through its arms sales. The global arms trade is the worst combination of political conquest and economic gain. The history of war will continue to maim and injure civilians as weapons, like land mines, continue to lay in peaceful and conflict-ridden lands. On average 5,000 people are killed by land mines each year. Millions of land mines are hidden in the ground in 78 countries. The United States, which doesn’t fear mines itself, has a stockpile of around 10.4 million anti-personal land mines–the 3rd largest arsenal in the world. Once placed in the ground, these weapons are incredibly expensive to clear. Land mines cost somewhere in the region of $3 to produce, and a staggering $1,000 to clear per unit. In 1997, in response to a global, Nobel Prize-winning campaign, the U.N. adopted an international Mine Ban Treaty, which is currently signed by 162 countries. Under the Mine Ban Treaty, the Parties undertake not to use, produce, stockpile or transfer anti-personnel mines and ensure their destruction. Thirty-six countries, including China, Russia and the United States, which together may hold tens of millions of stockpiled antipersonnel mines, are not yet party to the Convention. 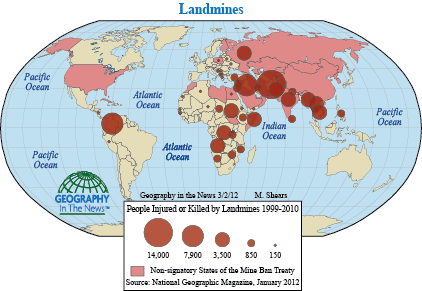 The three countries continue to manufacture land mines. The P5 are the primary sellers of tools of war. They also are the primary hindrances to obtaining justice once the bullets stop flying. The International Criminal Court prosecutes individuals for the international crimes of genocide, crimes against humanity, and war crimes. Unlike France and the UK, which are a party to the International Criminal Court, China is opposed to the Court (like North Korea and Somalia), the US no longer intends to ratify the treaty (in line with Sudan) and Russia has not ratified its agreement (akin to Syria and Yemen). The majority of P5 nations prefer to protect themselves, preventing justice to be served for crimes against humanity. They are not world leaders. They are cowards. And should be treated as such. Unfortunately, the Cold War hasn’t melted away. And neither has the threat of nuclear annihilation. There are currently 15,375 nuclear devices in the world. Of these, 98 percent (or 15,045) are held by the P5. The U.S. and Russia account for nearly 93 percent of all nuclear weapons. These two nations have it within their power to end the threat of nuclear war. The other three nations with large stockpiles of nuclear weapons–Pakistan, India and Israel–received assistance from the U.S. in developing their own nuclear programs. Rather than creating a safer world following WWII, the P5 have made the world more turbulent. They split into Eastern and Western superpower blocks during the Cold War, which has continued following the fall of the Berlin Wall. Despite their differences, the Eastern and Western blocks agree that they should continue holding the balance of power globally. Worst of all, the P5 have a poor track record when it comes to supporting the means for peace. Last month, UN General Assembly (UNGA) members have defied the P5 by voting to ban nuclear weapons. The UNGA’s First Committee passed an historic resolution to begin negotiations for a legally binding nuclear weapons ban treaty next year. The landmark resolution passed 123 to 38 – with 16 countries abstaining – and succeeded despite smaller states accusing nuclear-armed countries of “pressuring“ them to oppose the ban. The most effective strategy to prevent war is to mitigate its causes. One of more overlooked (at least in news media) sparks for war is climate change. Even the U.S. Department of Defense has recognized the danger, saying that “global climate change will aggravate problems such as poverty, social tensions, environmental degradation, ineffectual leadership and weak political institutions that threaten stability in a number of countries.” The problem of global climate change is directly linked to rapid industrialization, which provided incredible wealth in a handful of countries. The P5 nations, and their allies, being the biggest beneficiaries. 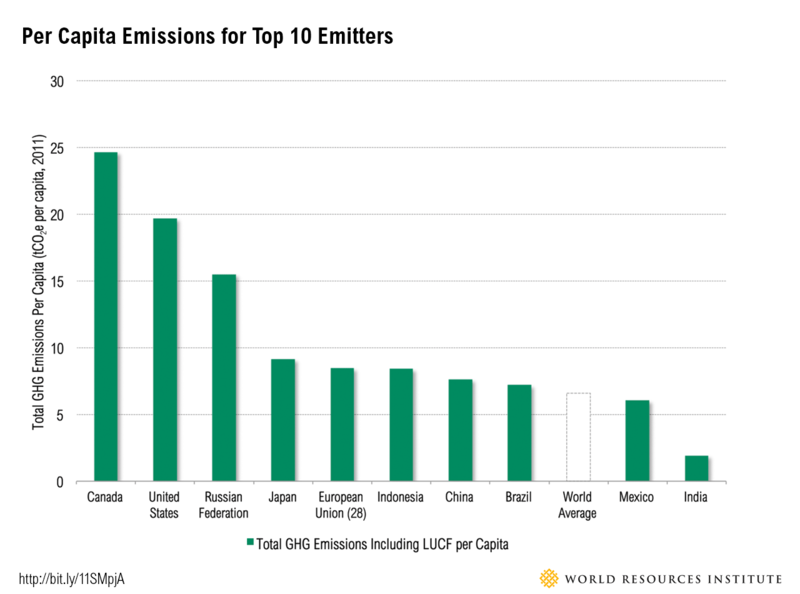 Although the P5 nations today produce similar levels of greenhouse gas emissions, the trend hasn’t always been like this. China began industrialization far later than other nations but its high population is closing the cumulative gap. It’s also important to remember that much of China’s emissions are linked to the products shipped to European and American consumers. The United States, with its population of 300-plus million and long history of industrialization, has done more to cause climate change than any other nation. 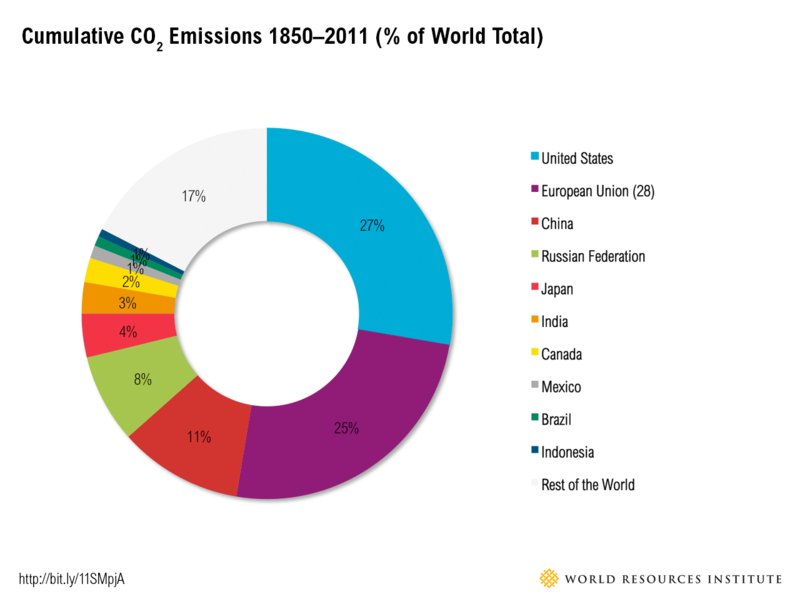 The United States is responsible for at least 27 percent of global emissions. The European Union, including France and the UK, account for another 25 percent. At 8 percent, Russia has the lowest contribution among the P5 nations, although it is still a substantial amount. Like the issue of nuclear weapons, the P5 are among the top 5 polluters and are responsible for the damage caused by high industrialization on those affected by climate change. A study led by Jacob Schewe of Potsdam finds that “the combination of unmitigated climate change and further population growth will expose a significant fraction of the world population” to “chronic or absolute water scarcity.” Current agricultural models estimate that climate change will directly reduce food production from maize, soybeans, wheat and rice by as much as 43 percent by the end of the 21st century, encompassing a loss of between 400 and 2600 petacalories of food supply. But incorporating hydrological models reveals that when accounting for the decline of freshwater availability, there would be an additional loss of 600 to 2900 petacalories – potentially wiping out quantities equivalent to the total present-day food supply. There’s an old saying that people revolt before they starve. This is the future that the highly-industrialized countries, especially the P5, have brought to bear. Climate refugees will join the movements of displaced people who have historically fled conflicts (worsened by the arms sales noted above) and environmental hazards, like earthquakes. Environmental forced migrants are people who have to leave due to deteriorating environmental conditions, such as the slow deterioration of their environment due to deforestation or coastal deterioration. Environmental motivated migrants, on the other hand, are people who choose to leave to avoid possible future problems, such as declining crop productivity caused by desertification. One example where climate change contributed to environmental displacement and ultimately an armed conflict is Syria. Researchers acknowledge that many factors led to Syria’s uprising, including corrupt leadership, inequality, massive population growth, and the government’s inability to curb human suffering. But a report published in the Proceedings of the National Academy of Sciences compiled statistics showing that water shortages in the Fertile Crescent in Syria, Iraq, and Turkey killed livestock, drove up food prices, sickened children, and forced 1.5 million rural residents to the outskirts of Syria’s jam-packed cities–just as that country was exploding with immigrants from the Iraq war. The suffering and social chaos caused by the drought were important drivers of the initial unrest. 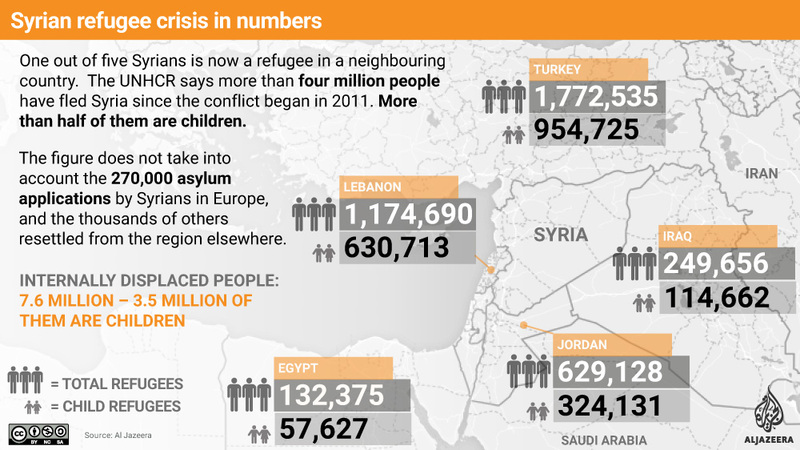 The five nations of Turkey, Lebanon, Jordan, Iraq and Egypt collectively host over 4.7 million Syrian refugees. In contrast, the P5 host around 32 thousand; this equates to around one out of every 200 Syrian refugees. The P5 has a cumulative GDP fourteen times that of the five countries neighboring Syria. These low figures of refuge offered by the P5 nations are even more shocking when you consider that the P5 nations are supplying weapons and bombing fighters in Syria as well as Iraq. Clearly, the world’s “most powerful” countries are not doing their fair share. Thanks to the legacy of the Iraq invasion led by the U.S. and the U.K., 3.9 million people were already internally displaced in Iraq before the war in Syria started. Another region of the world where all of these issues–nuclear weapons, climate change, displacement of people–intersect is the Pacific Islands. The Marshall Islands are one of many that highlight these overlapping concerns. The United States tested their nuclear weapons in the 1950s and 1960s, causing scores of health problems and displacement. Now, climate change may wipe the Marshall Islands off the map, as sea levels rise. The United States in a pathetic excuse for a solution provides Marshall Islanders asylum. Unfortunately, they will become exiles to a nation underwater. Will the U.S. ever learn its lesson?! The Security Council spend the past seven decades failing to eliminate the threat of nuclear annihilation, which they themselves created. Now, the world has to face the threat of climate change; also primarily caused by the P5 nations. We can’t wait for their slow and inconsequential attempts to correct their own misbehavior. It’s up to all of us to demand change. The world depends on it.